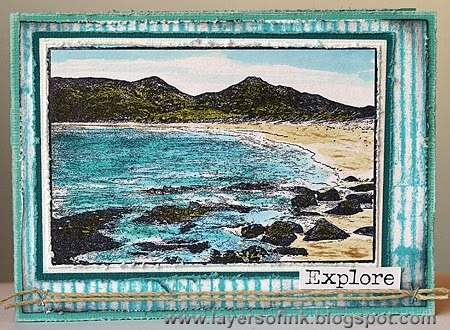 On this next card, I stamped the quote onto two different but co-ordinating papers, and cut the lighter one into strips. I mounted these strips onto the darker green image, and then filled in the spaces inside the letters with Stickles. I look forward to many more fun projects with this quote stamp! 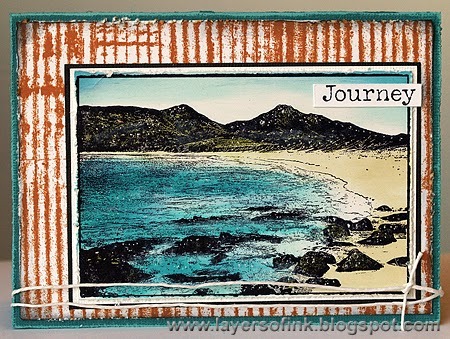 These two tags and ATC are stamped with the wonderful new quote stamp DDQS003 Journey . I stamped them onto white cardstock with Versamark ink and heat-embossed with black and dark blue embossing powder. I coloured the quotes with Distress Markers and blended it with water and a brush. I stamped the black tag (above) with frost white Colorbox ink and background stamp DDBS025 World Map onto black paper. To make this card, I first stamped the quote with Versamark onto a white card and heat-embossed it with black embossing powder and masked it. I stamped the Fancy Flourish with Distress ink Pumice Stone and the Castle with black StazOn ink. I sponged it with Distress Vintage Photo and I sponged the edges with black ink. I removed the masking paper and glued it onto white, black and brown cardstock. Belinda here again with an art journal page to share using the BRAND NEW Beauty Quote Stamp. I had so much fun getting inky with this page. It really is nice to just play with stamps and inks and mists without actually have a clue how it is going to end up. I started this page probably more than a year ago. I remember having some scraps of torn book paper left over from another project and didn't want to waste them so I glued them onto a page in my art journal. I added some Distress Inks and maybe a bit of mist and gessoed over a harlequin stencil in places. 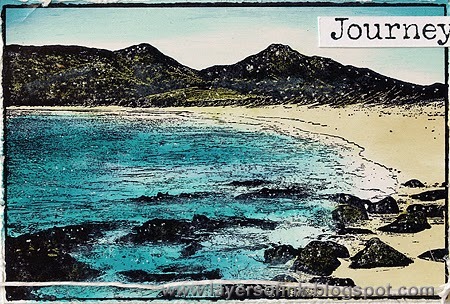 Then I wasn't sure what my next step would be so the journal was closed and set aside...for months! 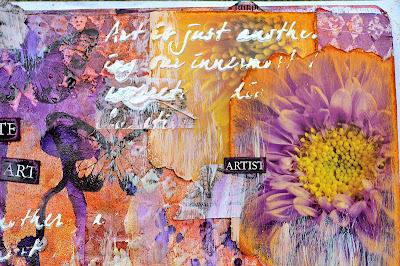 I used the Harlequin Background Stamp to start with and applied in random places on the page using Tim Holtz Distress Embossing Ink. I then heat set with Ultra Thick Embossing Enamel (UTEE). Next I rubbed in Tim Holtz Distress Inks in Wild Honey and Seedless Preserves. My next step was to apply Dylusions Ink Sprays in Crushed Grape and Lemon Zest and let them drip down the page. Once they were dry, I added some images from the Bright Blossoms Photochips that I had cut out, sanded and inked. I added some torn strips of Tim Holtz washi tape and stamped some butterflies from the Butterflies Stamp Set. I used a script style stencil and swiped over some Viva Décor 3D Stamp Paint in white and allowed to dry. I dry brushed on some gesso before applying the quote stamp in the centre of the page using Ranger Archival Ink in Jet Black. To ensure the larger words really stood out, I traced around the edges of the letters with a white Posca pen. My final step was to add some relevant words cut from the Prague Wordstrips. It just goes to show that there is so much fun to be had by just playing with your supplies rather than having a set plan in mind. 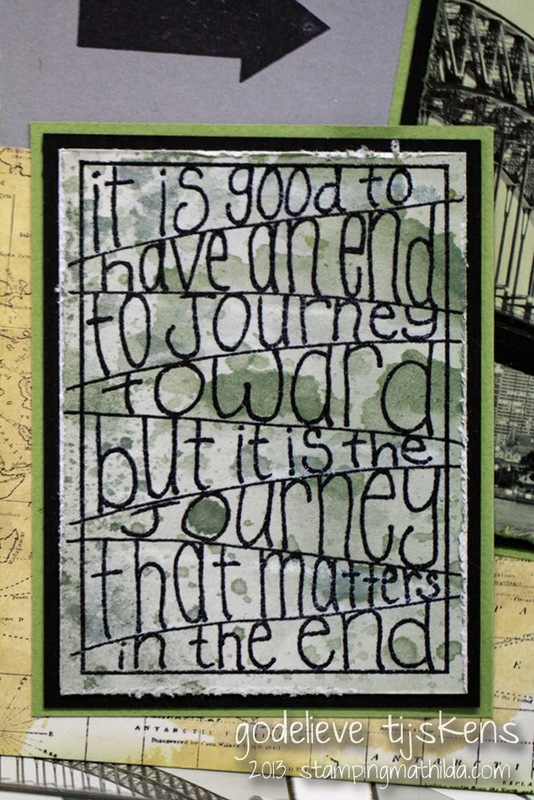 I know that this has inspired me to create more art journal pages and have more fun just getting inky. I do hope you get some inspiration from this too. Just don't forget to 'play' now and then.